POSSUMS aren’t really noisy animals. But they do generate clicking sounds as well as hissing and growling particularly when they are looking for their mates in the breeding season. 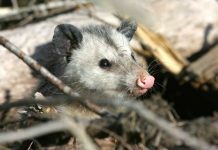 Possums will probably hiss or growl when they feel threatened. 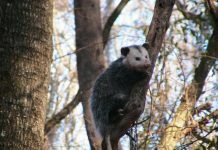 Unlike adults, young opossums will sound like sneezing perhaps to call out their parents. What Does a Possum Sound Like? – What Noise does a Possum Make? Unlike American opossums, Australian ringtail possums are thought to produce as many as 18 sounds. When they wish to threaten their counterparts, they become vocal and sound like grunt, hiss, growl, and screech. However, when they stressed, ringtail possums will produce chattering call or buccal click. Other possum calls include chittering and chirruping. 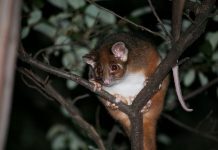 Like Gliders, ringtail possums aren’t only less vocal they produce soft calls too. Possums are most likely to be vocal when they are either aggressive or the young gets separated from its parents. When possums become highly active they generate high-pitched chirruping twitter. Studies suggest that the threatening sounds of possums are highly complex in that the pitch and intensity are varied.